1. Access it and navigate to Settings. 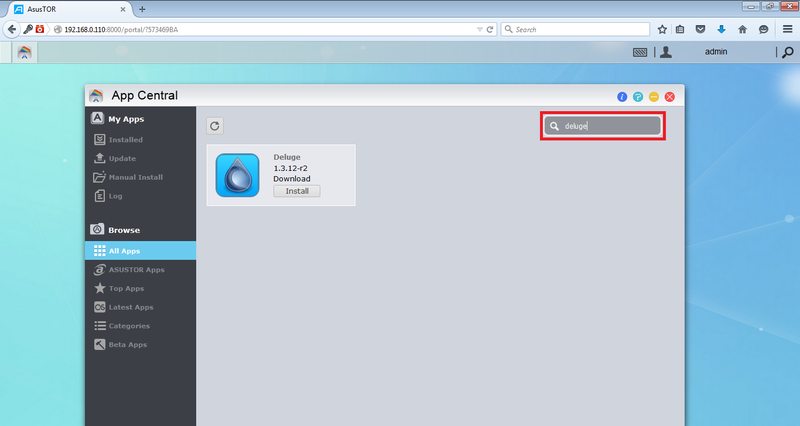 2.Go to the Network section and click on Network interface tab. 3. 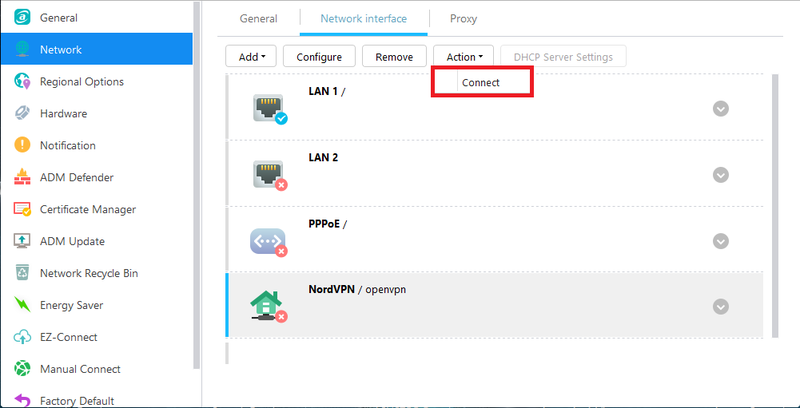 Press Add and select Create VPN. 4. 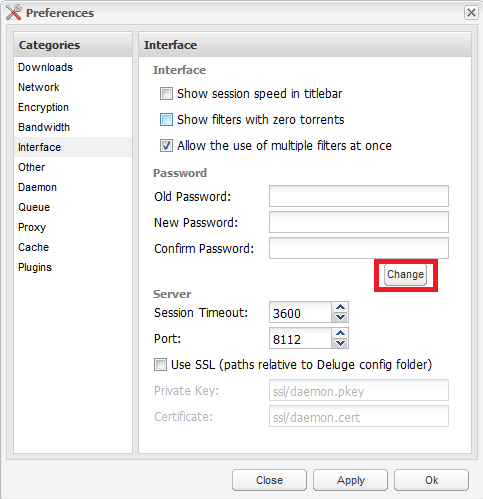 Then select Import Configuration Files from OpenVPN Provider. Press Next. 5. Fill in the following fields as in the screenshot bellow. 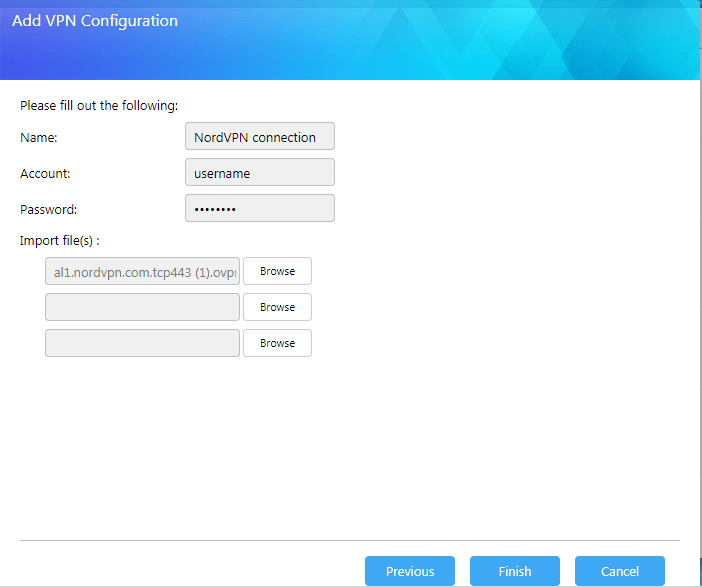 You can choose any of our servers to connect to by importing one of the files from here: OVPN Files. Afterwards press Finish. 6. Once the profile is created, select it and press Connect. Now your device is connected to our VPN service. Now it is time to make sure the VPN connection is indeed there. 1. First off go back to the main AsusTOR window. You will next need to open the App Central from there. 2. In the App Central window that opens up select All Apps. You can see it on the left side list. 3. 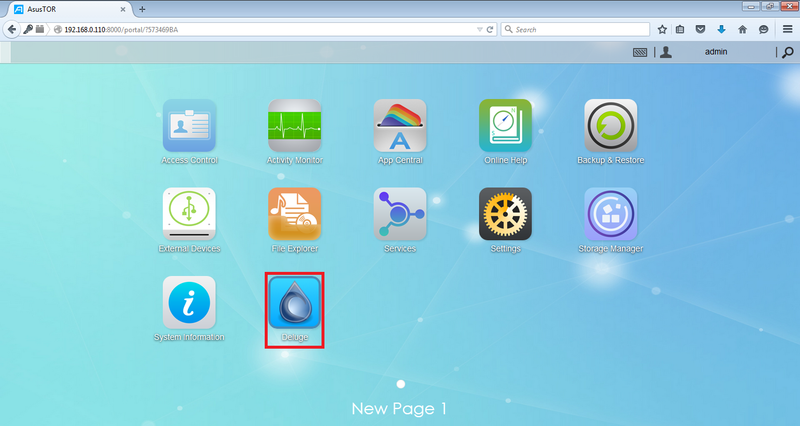 Once you open the list of all available apps, use the search bar at the upper right corner of the window to search for Deluge. The list of available programs should get reduced to Deluge only. 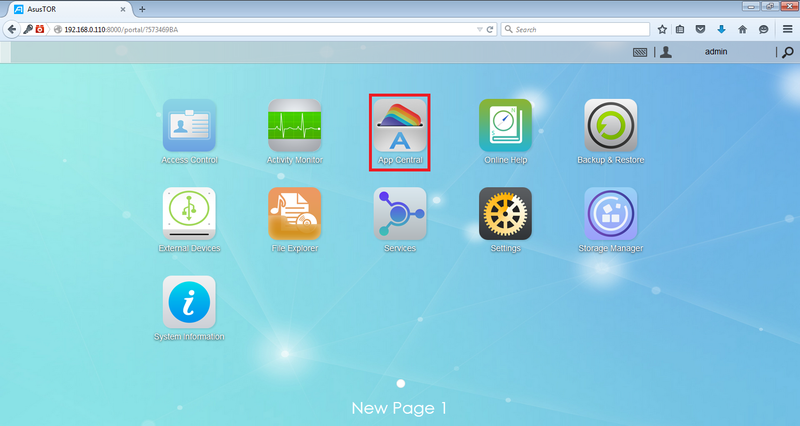 Afterwards click on the Install button near the Deluge application to download it to your AsusTOR system. 4. 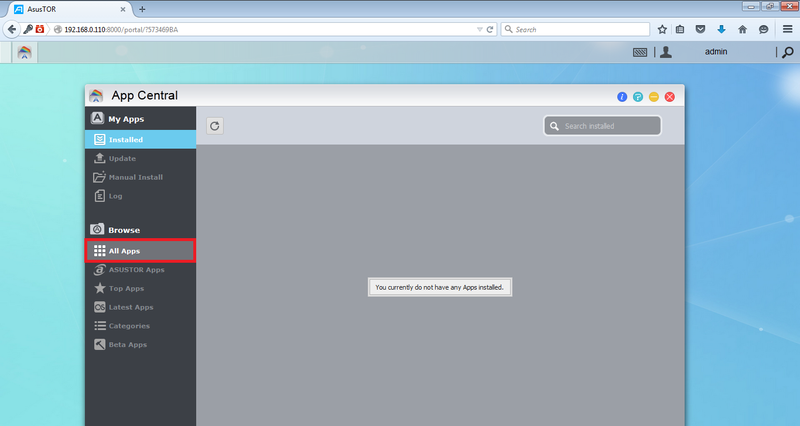 After you hit Install a new pop up window will show up specifying what is going to be downloaded. Please click Install. 5. You will need to wait a bit for the app to be downloaded and installed. 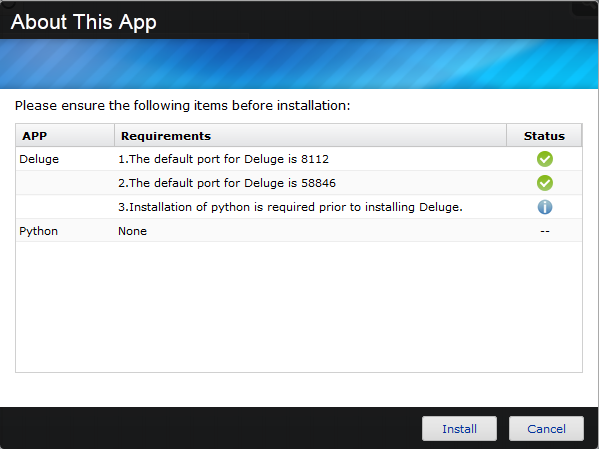 Once the process is complete the pop up window will get closed and the Install option near Deluge will change to Installed. 6. Now you can go back to the main AsusTor window and you will see that the deluge is already available. Please open it. 7. A new tab will open up asking for your deluge password. By default it is deluge. 8. After you enter the default Deluge password, you will be prompted to change it which we recommend doing by clicking Yes. 9. 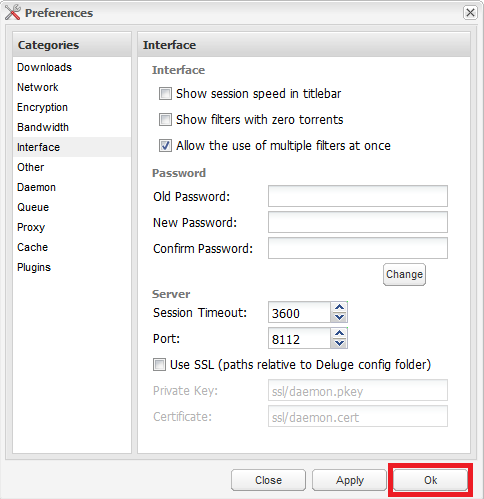 A new pop up window will show up, please select the available 127.0.0.1 host and connect to it. 10. You will now be able to change your password by filling out “Old Password”, “New Password” and “Confirm Password” fields and hitting the Change button. 11. 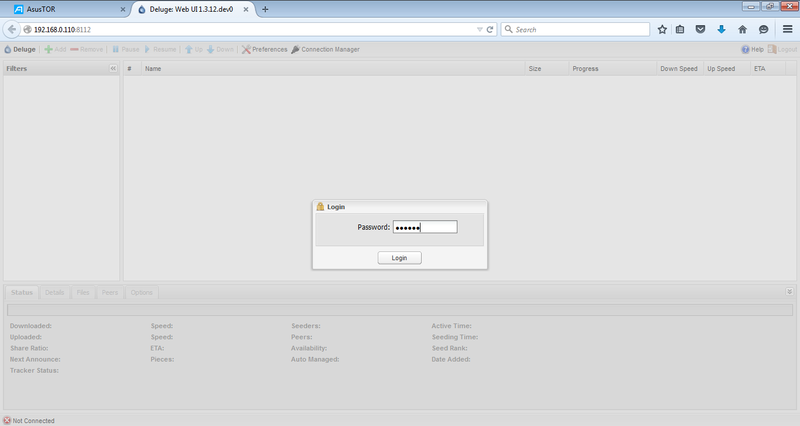 Once the password is changed, click on OK at the lower right corner of the window to proceed with the set up. 12. Now please go to the http://ipmagnet.services.cbcdn.com/ website. Please right click on the “Magnet link” text that is highlighted and select the Copy Link Location option. Do not close this tab until we confirm that the VPN connection is active. 13. Now go back the Deluge tab and click on Add in the upper right corner of the window. 14. In the new pop up window select URL option. 15. In to the Url field, paste the link of the Magnet link you have copied in step #35. You can paste using Ctrl + V command on Windows and Linux or Command + V if you are a macOS user. Once you paste the magnet link into the Url field, click Add. 16. In the Add Torrents window you also need to click Add that is located at the bottom of the window. 17. The magnet link torrent will show up in the list of your active torrents. 18. Now go back to the website you have copied the magnet link from and you should see the IP address of the VPN server you are connected to. In case the IP address does not show up right away use Update option on the right side of the website to refresh the list. 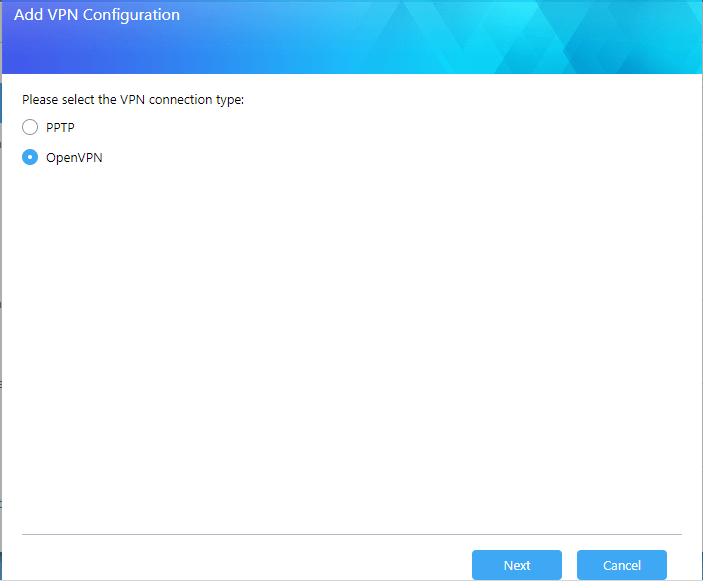 If you see the IP address of the server you are connected to, you have successfully connected to VPN. Well done!